Trump Doubles Down: Ask Gen. John Kelly If Obama Ever Called When His Son Died In Combat [VIDEO] - Joe.My.God. Every day the Dotard-In-Chief finds a new way to demonstrate that he’s a detestable lying scumbag. 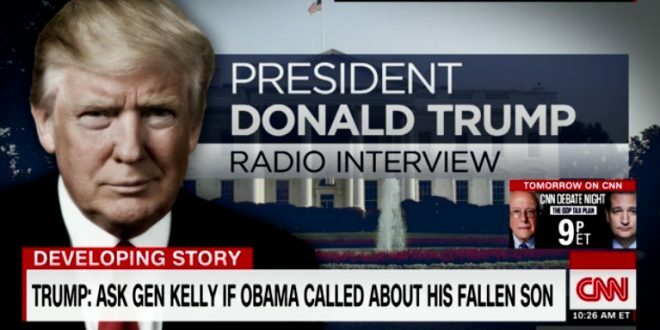 President Trump said Tuesday that anyone with questions of whether former President Barack Obama called the families of fallen service members can ask White House chief of staff John Kelly if he received a phone call from Obama. “I think I’ve called every family of someone who’s died,” Trump told Fox News radio host Brian Kilmeade. “As far as other representatives, I don’t know. You could ask Gen. Kelly, did he get a call from Obama?” Kelly’s son, Marine 2nd Lt. Robert Kelly, was killed while serving in Afghanistan in 2010. Ned Price, spokesman and senior director for the National Security Council under Obama, blasted Trump’s “inane cruelty” for bringing up the death of Kelly’s son in order to bash Obama.